Steps 1 through 3 are much simpler thanks to advancements in technology. When it comes to locating and scouting new hunting properties, onX is without a doubt the number one tool I have at my disposal. 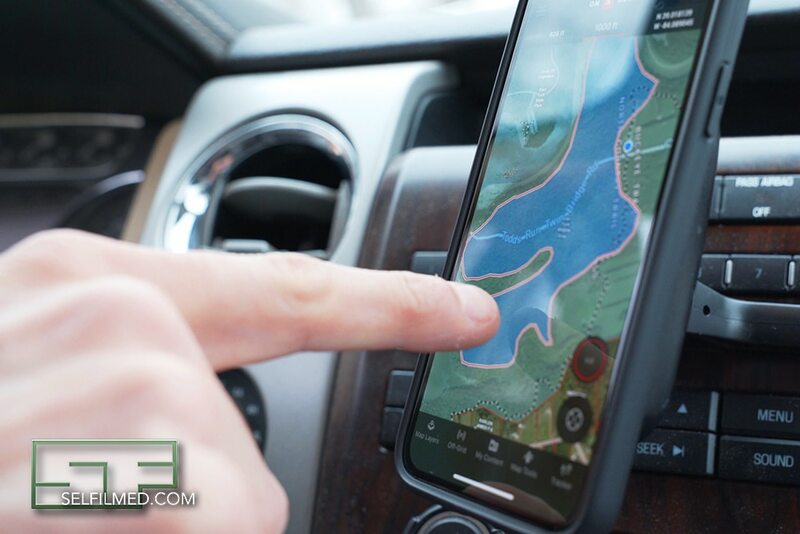 My favorite feature about the onX system is that you can access your maps directly from a smart device, no GPS or cell service needed. Simply download the onX Hunt App and create an account to gain access. To get you started, onX offers a free 7-day trial to a premium membership which includes access to map data for 1 state. If you don’t have a smart phone, don’t worry. You can also use onX through your internet browser. Access to 1 state and includes: Map Layers, Property Boundaries, Points of Interest, Custom Waypoints, and More. If you currently own a handheld GPS, you can also purchase the Premium + Chip membership which allows you to access your premium membership data on your smart device but also includes a microSD card for use in compatible GPS units. If you already own a chip, you can use your Premium membership to update it. The Elite Membership includes access to all 50 states and all Premium Membership features. This membership is by far the most popular, and when hunting many different states like I do, it is almost indispensable. 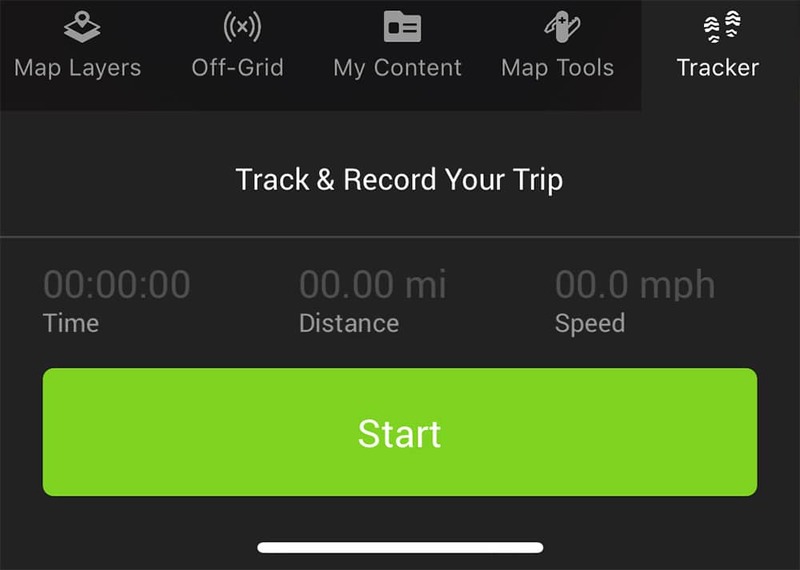 The great thing about the onX Hunt app is that it is packed full of great features, all designed to take your hunting experience to the next level. onX was also designed for hunters by hunters. At the backbone of the onX Hunt app is a panel of powerful tools/features: Map View, Map Layers, Off-Grid, My Content, Map Tools, Tracker. As an individual who hunts multiple states throughout the year, I find the elite membership to be a great deal. I typically hunt Ohio and Indiana every spring and fall, and there are usually a few other states mixed in. But even if you are just planning a hunt, having access to data in multiple states can help you make a decision on where to next pursue your game. The primary map view provides access to three main views: Satellite, Topo, and Hybrid(satellite images with topo overlaid). At the top of the map view is a “hamburger” menu-icon that allows you to you quickly manage your account and map settings. Within the map settings you can toggle the units from Imperial to Metric. You can toggle the coordinates between Decimal, UTM, and DMS. You can enable cross-hair visibility and you can also show off-grid area outlines. I love the “Pinch to Rotate” feature which allows you to change the orientation of your map to view your location from a specific vantage point. I find that 90% of the time, I have the hybrid view enabled. 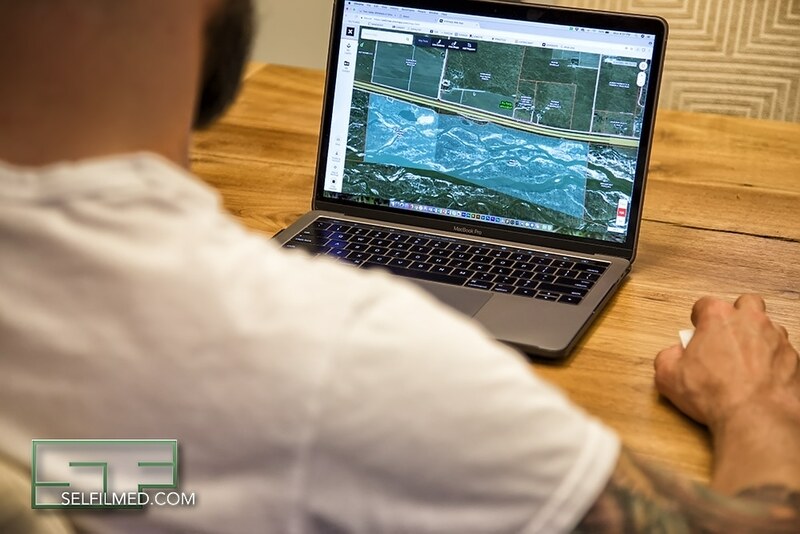 I like having access to the satellite imagery, but the topographical information also plays a big role in identifying funnels and other pinch points prior to taking your first step onto a property. Despite the amount of time I spend studying maps prior to my hunts, I also find myself looking at my map data during the hunt. Especially when I’m turkey hunting and trying to figure out where a bird has hung up on me! The Map Layers option allows end users to configure what they see on their map view. The main feature of this tool is the ability to enable data for the state(s) you have access to within the onX Hunt App. Each state has different features available, but most states at least have layers for private and public land information. Additionally, you can also see satellite imagery, 24k topographic layers, and national roads and trails for all states. On top of the state layers, you also have access to many National Layers including precipitation maps, wilderness layers, US Forest Service motor vehicle roads and trails, NWTF Wild Turkey Records, and RMEF maps. Many of the national map layers are free, however there are a few that are paid, these include Prairie Dog maps, B&C Trophy Big Game Records, and Eastmans’ MRS. All of these maps are packed full of great information and really help in your efforts to find a great hunting location. One great feature about these layers is that you can reduce the transparency of layers to easily stack layers. A note about the private land ownership; the ownership information is generally only updated once per year, and it is dependent on county records with the state. So there is a possibility that landowner names may be inaccurate if a property has recent changed hands. However, the app shows you the landowner’s tax address in addition to the overall acreage for the parcel, so if they do not live on the particular property chances are you know where to ask for permission. The Off-Grid feature is one of, if not my favorite feature available in the onX Hunt app. 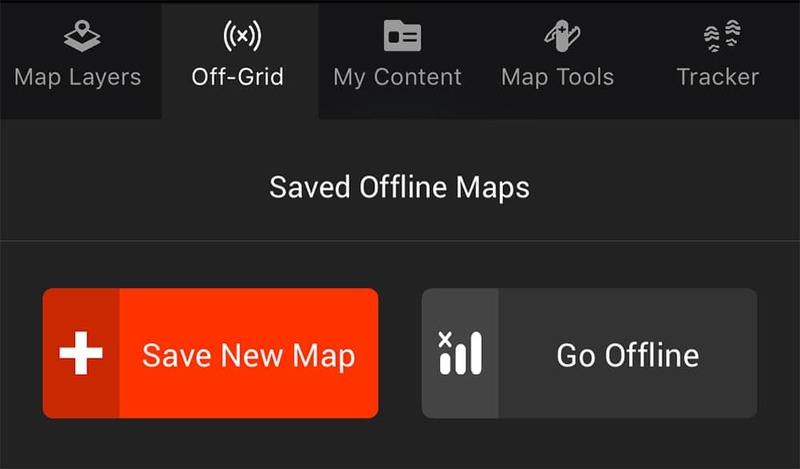 With the Off-Grid feature, you can download your map content for a specific area and go offline. This is great if you are planning a hunt in an area that you expect to have little or no cell phone reception to access the onX content. Your phone’s GPS will still work even without cell service. 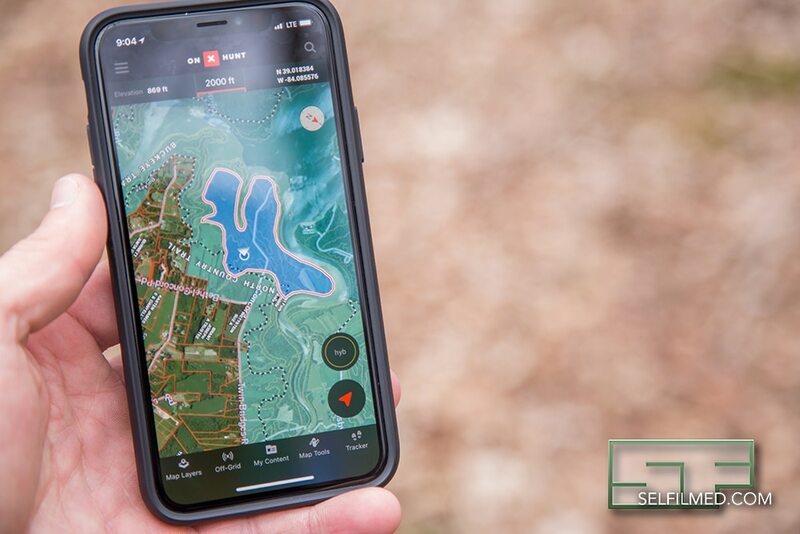 To use this feature, simply download your map content to your phone, enable GPS on your device, and you are ready to go! While you of offline, you can still access all of your waypoints which is extremely important. During this time, you can also mark new waypoints and continue using the other features of the application that do not require data transfer over a network. I have more than my fair share of hunting spots that I have poor reception, so not only does this feature help me out when reception is light, I find that it also helps preserve battery life when I can avoid my phone constantly fetching data from the onX servers. This can essentially replace the need for a GPS if you have a way to charge your phone. The My Content feature enables you to disable the view of stand locations, and other waypoint markers that you have added to your account. I often times find that when I am looking at a map from a wider/zoomed out view, I like to disable the my marked locations so that I have a cleaner view of the map. Another great feature I like to enable/disable as needed, is property outlines that I have created. Often times, farms that I hunt are made up of multiple parcels. In this instance, I like to create one large outline of the property and then disable the state layers. Like I mentioned above, this often times helps me view a cleaner map. Last but not least, you can also share waypoints and coordinates with your friends/hunting partners from this screen. Just be careful that you aren’t sharing your favorite honey hole! 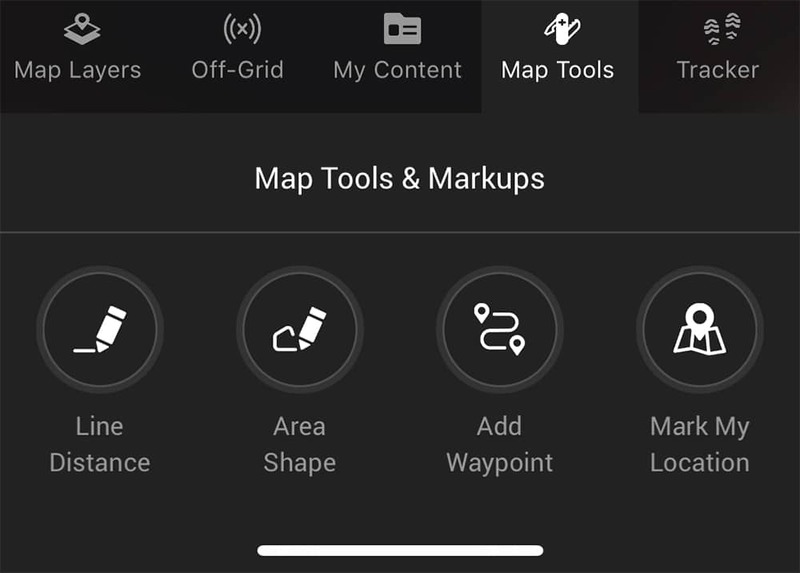 The Map Tools screen is packed with great features. Through this feature, you can measure line distances, outline and measure area, add waypoints, and mark location with custom icons. The vast majority of the time that I am using my onX, I am using the Map Tools. This feature is invaluable with measuring the size of food plots. This is helpful to not only help me determine how much food I will be providing to the wildlife in the area, but determine how much seed will be necessary to plant a given plot. Another feature I really like about the onX measurement tools is that I can measure a particular trail or path of entry to a given hunting spot, and based on having a known distance, I can come up with a more educated estimate of the time I’ll need to get set up for a morning hunt. I find this feature particularly useful when hunting an area for the first time. It’s easy to get to and from a stand in the broad daylight, but when you are suddenly plunged into darkness and trying to stay quiet to boot, it is nice to have a good idea of how long it will take you to get you and your gear to your spot. This can be a real life saver and help you avoid a prematurely ruined hunt. Additionally, all of your content can be sorted by type and by date. This is particularly helpful if you can’t remember what you named a location/waypoint, but you recall when you created it. The tracker tool is useful when you want to track a particular hike or path you have travelled. I often times use this feature to help me trace my steps when approaching a stand on public property in the dark that I might not be extremely familiar with. I also occasionally use this tool when I hike with my family or kids, and once or twice I have used it to track a bike ride. The use cases for this feature are endless. 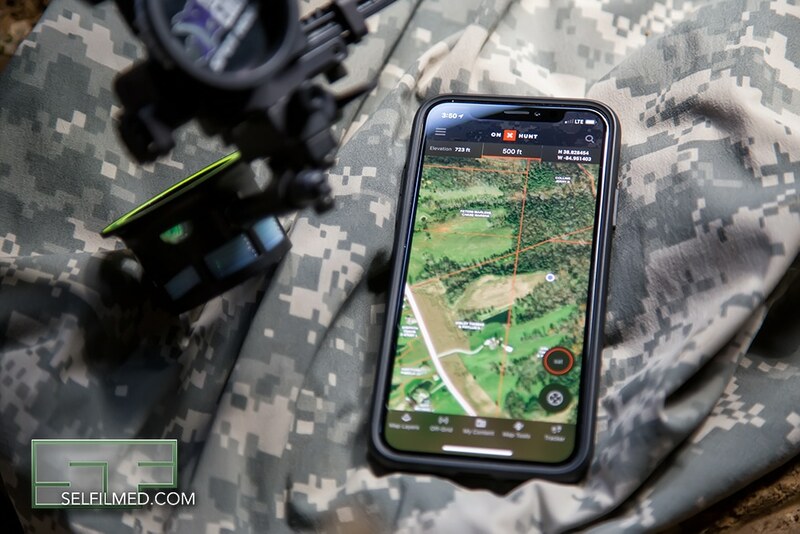 If you are the kind of person who relies on mapping technology to assist you in your hunting experience, I highly recommend you give onX a try. They have without a doubt changed the way that I approach hunting and property scouting in general. To learn more about onX, you can visit them at https://www.onxmaps.com/.